This was a stock chart for the ages -- if you're into classic roller coasters. 2017 will probably follow an equally chaotic pattern. Shares of Windstream Holdings (NASDAQ:WIN) rose 13.4% in 2016, according to data from S&P Global Market Intelligence. It was a roller-coaster year for the regional telecom, starting out with a 23% plunge in the first three weeks and reaching as high as a 60% gain by the end of October. Neither one of these extremes had much staying power, and the final full-year tally was far less dramatic. Telecoms of all flavors were drooping in January, as investors were fearing weak reports as the first earnings season of 2016 rolled around. Those fears turned out to be largely unfounded, and Windstream shares soared on a strong earnings surprise. The stock climbed another 18% higher in September, fueled by the announcement of new or expanded services in several key markets. But Windstream investors lost all of those gains and more in October and November. The company ran low on market announcements, and then decided to merge with network services specialist EarthLink (NASDAQ:ELNK) in an all-stock deal worth $1.1 billion. Investors saw more dilution than value in that business combination. The EarthLink merger is still pending, expected to close by the middle of 2017. The combination will roughly double Windstream's market cap thanks to a modest revenue boost paired with EarthLink's far wider profit margins. Since Windstream spun out its infrastructure operations under the Communications Sales & Leasing (NASDAQ: CSAL) banner to refocus itself as a pure service business, Windstream has more in common with its future partner than you might expect. For all the bottom-line promise the merger holds, Windstream investors will also see their current holdings diluted by nearly 50%. 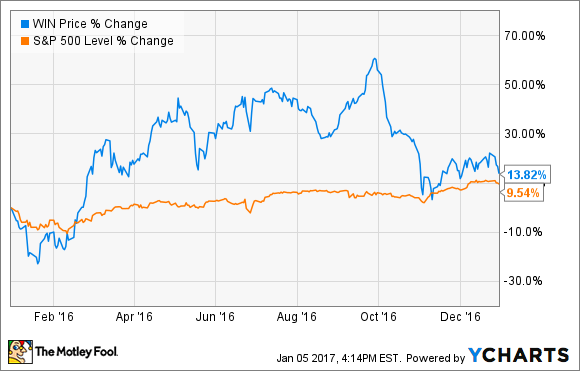 In other words, the best bet on Windstream stock in 2017 might be to expect massive volatility in an unpredictable direction.